Just Checking 3.11 is personal finance software developed by Brent Shelton. Balance all your checking and savings accounts on your PC. Enter transactions and the actual balance is automatically calculated. Set a "Cleared" date and the bank balance is automatically calculated. 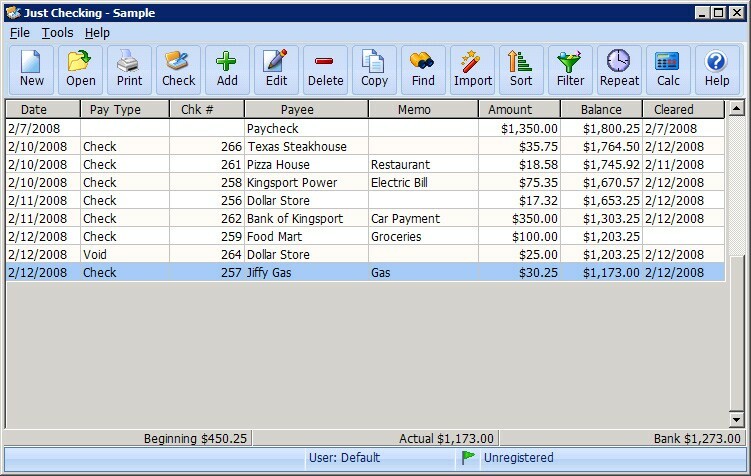 Features include: Sorting, Filtering, Check Printing, Check Layout Editor, Quicken and Microsoft Money Imports, Reports, Exporting, Custom Colors depending on transaction type, Custom Pay Types, Automatic Updates, Backup and Restore, Passwords. This home & hobby software is shareware, which means you can download and use Just Checking 3.11 for free during the trial period (usually for 30 days). At the expiration of the period you will have to buy the personal finance product for $14.95. Just Checking 3.11 is available at regnow and Brent Shelton website. Just Checking 3.11 supports English interface languages and works with Windows 98/XP/Vista. Latest Just Checking 3.11 does not contain any spyware and/or advertise modules, allowing installing it with no worries concerning valuable information loss. We has completely tested personal finance software Just Checking 3.11 many times, written and published the interesting article and uploaded installation file (3266K) to our fast server. Downloading Just Checking 3.11 will take minute if you use fast ADSL connection. Balance is an application to replace your check book register. 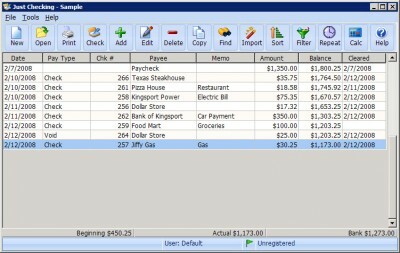 Accounts is a simple accounting application that lets you record your small business and personal finance transactions. iBank is an intuitive personal financial manager.